New York, New York, it's a hell of a town. That much is obvious. But in the gleaming city of glass, it can sometimes be difficult to remember the extent of the history that has happened through the many years the Big Apple has grown, fallen, gotten chomped up, and re-budded on the tree of life. Now, thanks to a new app, you can enjoy some top-shelf time-travel right on your phone. Yes, Mulberry Street in Chinatown/Little Italy has always been madness. According to NY Curbed, a new app called Déjà Vu can, in certain spots, spirit you away into the realms of yore...at least via photographs. It's creator describes Déjà Vu as "a collection of individually-curated old photographs that show the city around you as it used to be, each selected for a specific historical reason." And as always in life, there's weird and wonderful discrepancies between things that constantly change and things that seem to universally remain. a freight rail line that serviced the National Biscuit Company. The app, which retails for $1.99, is functional in Boston and Washington D.C. as well, but it's NYC where the abundance of photo sites really come to life. For instance, this war-looted pile of German helmets from 1918 seems like a monument for the ages, but in reality it was a publicity stunt to raise money for the 5th War Loan. Calling it "Victory Plaza" and adding statues and cannons totally helped the cause. However, these days, the image from the same vantage point just features the Halsey Building, and the now-ubiquitous automobile traffic. Would you have ever guessed what kind of history was hiding behind your lunchtime stroll? Not pictured: remnants of mass carnage. Park Ave's current, boring manifestation. Or how about the timeless similarities of well-known landmarks? NYC has plenty of them to compare and contrast temporal coolness with. The Flatiron Building in 1902. Don't ask what the rent was. The Flatiron in 2015. No longer one of the tallest, but still the most triangle-y. The app also uses your phone's GPS and gyroscope features to direct you to exactly where the original photographer stood, so your revamped modern image can match up as precisely as possible to the past. Proving that Boston's street designs were ridiculous, even back in the day. Have fun on your temporal traipse, history buffs! 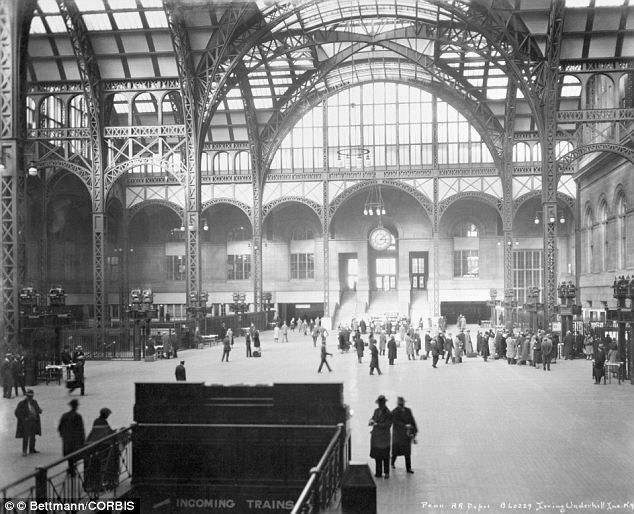 Just try not to cry too hard when you see what's become of the old Penn Station. Hint: add about a billion bricks.